Weekend is approaching and I am sure most full-time working mothers are looking forward to prepare some quick and easy nutritious dishes for the family during weekend lunch or dinner. In this post, I would be sharing 4 quick recipes (2 soup, 2 main dish) to inspire your weekend cooking for the family. Since working mum has a lot of household chores to take care during weekend, I specially pick up dishes that required minimum preparation time and use "steaming" instead of "stir-fry" to avoid oily kitchen stove. 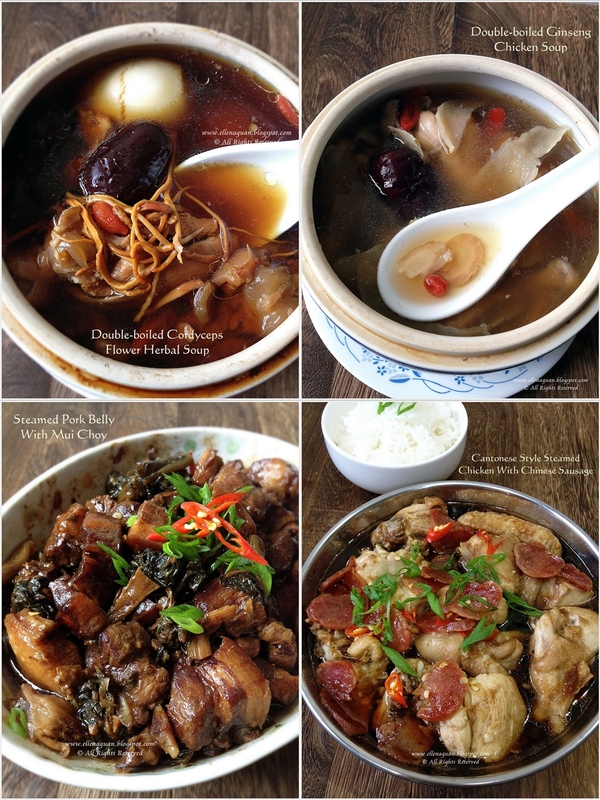 So I am sure these 4 simple soup and steamed dishes would come in handy for your weekend meal ideas. Cordyceps Flower (虫草花) is not the flower of cordyceps (冬虫草) but rather it is the artificial cultivation of cordyceps. Although cordyceps flower is not natural but it has similar nutritive value with natural cordyceps which helps resist oxidation and improve the body's immune system. You can easily purchased this herbs from major Chinese Medical Hall such as ZTP, Fu Hua and etc. 1. Clean, rinse and blanch the chicken drumstick in boiling water for 2 minutes, rinse and set aside. 2. Rinse all the herbs and set aside. Bring 750ml water to boil, add in all the ingredients and when the mixture comes to boil again transfer to a double-boiled pot and place it in the inner pot of the slower cooker. 3. I have set it "AUTO" mode to slow cook for about 3 hours. Remember to add water in the inner pot of the slow-cooker after you put in the double-boiler. 4. When done, season soup with salt according to your preference(i did not add any salt as the soup is already sweet and flavoursome to our liking) and serve warm before meal or together with meal. Pao Sheng (泡参) which is the root of the American ginseng is used in traditional Chinese medicine to improve "qi" and reduce "heat" of the body.Ginseng comes in a few form such as Ginseng Slice, Ginseng Root or whole Ginseng itself which are used for different purpose of cooking and medical terms. Here I have prepared Double-boiled Chicken Soup with Ginseng slices which helps to improved the QI circulation in our body as well as benefits those who always stay up late at night. 3. Set it "AUTO" mode to slow cook for about 3 hours. Remember to add water into the inner pot of the slow-cooker after you put in double-boiler. 4. When done, season soup with salt according to your preference and serve warm before meal or together with meal. 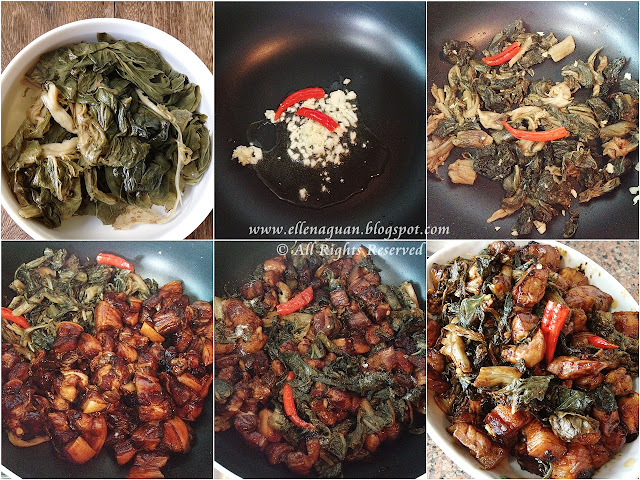 About two weeks back I have shared a recipe on "Steamed Chicken With Mui Choy (梅菜鸡)" which is a twist from the usual Pork Belly recipe and it is quiet well-received by most of the readers as well as my family. But there are also some readers who are interested on the usual Steamed Pork Belly With Mui Choy (梅菜扣肉) so in this post I am sharing a quick and easy recipe which will enable you to enjoy this all-time favourite at home too. 1. Rinse and wash mui choy (both sweet and salty) for 2 - 3 rounds to get ride of the sand and dirt. Soak it in water for about 10 minutes, remove and squeeze it dry using kitchen paper towel. 2. Next cut mui choy into about 2" sections and set aside. 3. Marinate pork belly with seasoning for about 5 minutes. Saute garlic and chilli with 1 tablespoon of oil till fragrant, stir in mui choy and continue to fry for another minute or two. 4. Add in marinated pork belly and fry together till the surface of the meat pieces are slight brown in colour. 5. Transfer the pork mixture to a deep steaming plate and steam it over medium heat for about 45 - 60 minutes till meat is tender. ~ For easy cooking, you can SKIP steps 3 and 4. Just mix mui choy with marinated pork and steamed it over medium heat till pork is tender. Although this dish might look simple but in term of taste wise, it is very delicious because of the aroma and flavour that is released from the "Lap Cheong (Chinese Sausage - 腊肠)" to the chicken. I love this one dish meal as it is so simple to prepared and yet it goes so well with even just a bowl of steamed rice. 1. Marinated chicken pieces with dark soya sauce, rice wine, minced garlic and ginger together with cornflour and Chinese sausage for at 30 minutes in the fridge. 2. Next arrange the spring onion in steaming plate, top with marinated chicken pieces and scatter some cut chilli on it. 3. Steamed in a steamer over medium heat on stove for about 15 minutes or till meat is cooked through. 4. Off the heat, leave the chicken in the steamer for another 5 minutes to relax the texture of the meat (learn this tip from the chicken stall owner). 5. Garnish it with extra spring onion, cut chilli and serve with steamed rice. Till then have a great weekend ahead. Will share more quick and easy weekend dishes in near future. Do drop me a note in the comment if you wish to see your favourite dish being featured on the "Weekend Dishes" recipes. oooohhhhh this post reminded me so much of my mommy's cooking. Ellena, All your dishes look so delicious making me hungry by looking at it. Definitely must try them for sure. Yes! Mid-Autumn festival is around the corner, I wish you and your family 中秋节快乐 too!!! Love all your mooncake creation! Your dishes look AH-MAZING and unbelievably professional! I'm astounded by how pro they look! Am def inspired to cook them using your recipes...thanks! Ahhh so comforting! I love everything but the pork belly one must be my favorite of all! Thanks for the recipes! I'd loved to try the ginseng chicken soup using the double-boiled method, but I don't know the right size to get. They all look so small, I can't imagine putting 2 drumsticks in them. Could you share the size of the pot you use, how tall and how big in diameter? Mine was about 1.5 litres capacity which is consider as medium size. And it fix nicely into my 2.5 litres slow cooker :) I got it from fairprice a few years back, but sometime i still see they have them in stock. Do check it out. Thanks! I have a better idea now. Will check them out! Can I find out is double boiling the soup same as boiling direct with slow cooker? Is there a difference in taste or nutritional value? Hope you don't mind me asking as I am confuse, I usually use my slow cooker to make soup until I read your blog. Hi double-boiled and direct boil in slow cooker is different. As in double-boiled, you put the ceramic pot into the slower cooker and "steamed" cook it with water on the slower cooker pot. In this way, the herbal soup taste more fragrant and it also lock up the nutritional value of the soup. Hi, where can i get mui choy? Hi Lily, MuiChoy get be purchase at those dried stuffs provision stores which sell salted fish, packet sauces and etc in the wet market. How do I prepare the chinese sausages? For my case, I always removed the outer skin (peel it off) of the Chinese sausage before using.